This month, we interviewed Kim Lutes, who was concerned about a proposed bill and took action. She recently testified against the bill at a Minnesota House of Representatives committee hearing. Kim, why did you decide to testify at the Legislature? There was a bill before the House of Representatives that would have made changes to civil commitment, including requiring law enforcement to take some people living with mental illness into custody if they missed their weekly doctor appointments. As someone living with a mental health diagnosis, I knew that this type of heavy-handed approach to mental health care would not work, and that it would be in violation of people’s civil rights. I knew that the reason I was able to move into recovery from my illness was because I had mental health providers who saw me as a person of integrity and built trusting relationships with me. Knowing first hand how important it is to feel respected and supported by mental health providers, I felt that it was my duty as a citizen to speak out against this harmful bill. What was it like to testify in front of your elected officials? It was scary. I had five minutes to say what I wanted to say. I wrote my testimony out ahead of time and practiced it in front of the mirror. But it was challenging, because legislators are not always careful about how they talk about issues related to mental illness. The language some of them used was surprisingly antiquated and based on old stereotypes. I hadn’t prepared myself for that, so I felt a bit offended at times. But, I felt good about what I had to say because it came from my life experience. I also felt good because merely by being there and sharing my expertise, I was challenging those old stereotypes. Aren’t there advocates out there who speak on behalf of people living with mental illness? Why didn’t you just let them do the work? There are a lot of advocates at the Capitol trying to make sure that those of us who live with a mental health diagnosis get good care. They are usually family members, friends or providers of mental health care. I appreciate the work they do. They are the people who were there for me when I was sick. But, when it comes to truly understanding what it is like to live day to day with a mental illness, the people who are the true experts are the people who actually live with a mental illness. We are the people who know first hand what works and what doesn’t. Therefore, I felt that in order to make a good case against the bill, someone needed to talk about what it is actually like to live with a mental illness. The unique perspective of someone living with mental illness is often missing in public conversation. You say that the perspective of someone with lived experience is often missing? What do you mean by that? When conversations about how mental health services are delivered in our state take place, people living with mental illness are rarely at the table. I think the reason for this is the perception that people with mental illness are not able to speak for themselves, or are too impaired to effectively be a part of those conversations. This perception is false. People living with mental illness are able to add an invaluable perspective to conversations. They are the experts. I have found that since there are few opportunities for people like me who have lived experience to give input into important decisions, we need to sometimes invite ourselves to the table. That is why I signed up to testify against this bill that was being discussed by my elected officials. I believe that it is important to point out that everyone living with a mental health diagnosis is unique, and that their experiences and perspectives are unique, too. One voice of lived experience at the table is not enough. We need lots of people to be willing to speak up. What are other ways people who live with mental illness can participate in public policy discussions? Almost every county in Minnesota has a local citizens mental health advisory council. Check with your county to see if there are openings, and apply to be appointed. The State of Minnesota also has a variety of citizen advisory councils related to mental health. You can check with the Minnesota Secretary of State’s office for a list of openings. 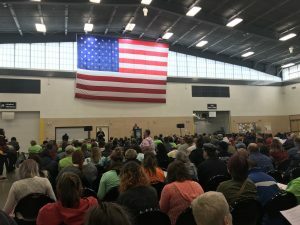 Occasionally, the Department of Human Services or counties hold listening sessions to get feedback from citizens about issues related to mental illness. When those are announced, take the opportunity to participate and give your perspective. This entry was posted on March 30, 2018 by Shannah Mulvihill. Ask the Advocate: How Can I Be an Advocate for Myself? Meet Arthur: he is a person who lives with a mental illness and a physical illness. Like many of our callers, he expressed a need for more help in his home. Arthur and I talked at great length about his needs and what resources were possibly available to him. At Mental Health Minnesota, we encourage our callers to advocate for themselves so that they realize the rewards of taking action. As the peer advocate, I wanted Arthur to feel the power that comes from self determination and successful resolution. Together we created a plan and Arthur set out to accomplish it. Arthur wanted to apply for the CADI program so that he could have PCA services covered by his health care plan. He called the county social services intake line and requested an application. The next step required him to fill out the application and send in the appropriate supporting documentation. 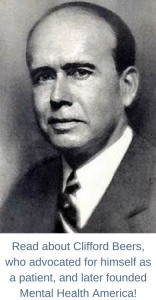 Initially Arthur was turned down for the program. Rather than appeal the denial, which was Arthur’s first instinct, we discussed the quicker possibility of reapplying again given that things had recently changed in his life. He reapplied and this time was granted approval. Today Arthur has help in his home so that his needs are being adequately met for him to remain living in the community. And the best part of all: Arthur advocated for himself! Advocating for yourself is an important part of mental health recovery. Self-advocacy is an important skill for everyone, but can be challenging to do. It takes time, planning, and support. At Mental Health Minnesota, our Peer Advocates often coach or support people in self-advocacy. 1. When you are faced with an issue, concern, or barrier, evaluate the situation. Think about what your goals are and what you would like the outcome to be. 2. Even though you are advocating for yourself, you do not have to do it alone. Reach out to your support network and ask them for feedback. You can also contact Mental Health Minnesota and speak with a Peer Advocate. 3. Explore your options. Consider some possible solutions for the issue at hand. Think about what you can do on your own, and what you might need some help with. 4. Start to develop a plan of action. Break down the things you need to do into small, manageable steps, rather than trying to accomplish everything all at once. 5. As you are developing your plan, stay organized. Write down questions you have, gather relevant documents, and track your progress by taking notes. Keep records of the organizations and people that you contact. 6. When it is time to advocate for yourself, be prepared. Bring notes with you, or have them in front of you if you are talking on the phone. Articulate your concern clearly and calmly. Remember to be as concise as possible while explaining your concern – try to keep all details relevant to the issue at hand. More than 500 people attended this year’s Mental Health Day on the Hill, held on March 15, 2018. People came from across the state to attend the annual rally and meet with their legislators. The theme this year addressed parity and equity for mental health. While great strides have been made in building Minnesota’s mental health system, there is still significant work to do to truly have parity and equity for mental health treatment and services. 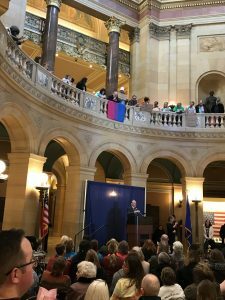 “Despite so many years of work, mental illness is still treated very differently from physical illness, especially when it comes to early recognition and treatment of symptoms,” said Shannah Mulvihill, Mental Health Minnesota’s executive director. This year, the Mental Health Legislative Network, which sponsors Mental Health Day on the Hill, also set up an information room in the Capitol after the rally so that people attending could find out who their legislators were and how to find them. More than 50 people visited the information room and then went to see their legislators, in addition to many people who had set up legislative meetings. Didn’t make it to Mental Health Day on the Hill this year? You can still take action! Reach out to your legislators to share your story and your concerns. Don’t know who represents you? Click here to find out! And remember, Mental Health Minnesota’s Ambassador Program also provides training and opportunities to influence public policy as well! View photos from Mental Health Day on the Hill here! Mental Health Day on the Hill is just around the corner! 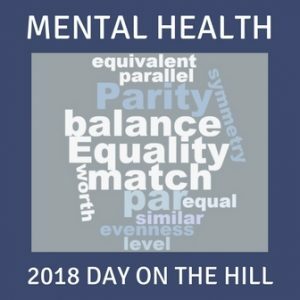 This year’s Mental Health Day on the Hill is coming up on Thursday, March 15, 2018. This year’s theme addresses parity and equity for mental health. We’ve made great strides in building Minnesota’s mental health system, but there is still a great deal of work to do to truly have parity and equity for mental health treatment and services. Join us at this year’s Mental Health Day on the Hill to learn about the issues, talk to your legislators, and make your voice heard at the rally! Mental Health Day on the Hill will begin with an issue briefing at the Cedar Street Armory in St. Paul at 9:30 AM. We will then move to the Capitol Rotunda for a rally from 11 AM to 12 PM, and then spend the afternoon visiting with legislators (Please make appointments in advance as much as possible). Not sure who represents you? Click here to find out. Volunteers will also be available to help you find your legislators if you’re not sure where to go. Need a ride? Free bus transportation is available across the state so you can attend Mental Health Day on the Hill. Check out the routes and register online here. Interested in learning more about lobbying and what YOU can do to make your voice heard this legislative session? Register here for our ‘Lobbying Simplified’ webinar on Monday, March 12, from 5:30 – 6:30 PM! This entry was posted on February 23, 2018 by Shannah Mulvihill. 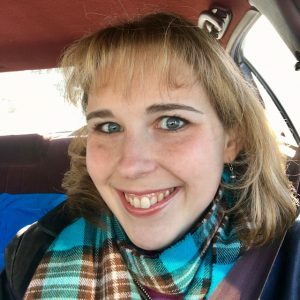 This month, we were excited to interview Lisa Gjerde, who has served on the Carver County Mental Health Advisory Council for the past eight years. Lisa, could you give us a little bit of background information about Local Advisory Councils and what they do? 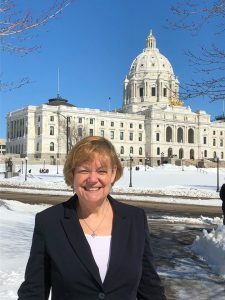 While the State Mental Health Advisory Council in St. Paul meets monthly and reports directly to the governor, legislation also mandates that every county in Minnesota has a local mental health advisory council (LAC). Membership represents child and adult mental health concerns, and consists of a variety of people, including those who live, or have lived, with a mental illness; families of people with a lived experience of a mental illness; and mental health providers. LACs review and evaluate mental health needs and services in their communities and make appropriate recommendations to their county commissioners. Could you tell us a little bit about yourself, and what led you to apply and become a member of the Carver County LAC? It has been my privilege to serve on the Carver County LAC for the past eight years. To explain where I am today, let me say that knowing a situation through one’s life experiences helps a person better understand its intricacies. For example, a cancer patient will learn more about the disease and how to treat it, and sometimes becomes an advocate for other cancer patients. The same is true for mental health. 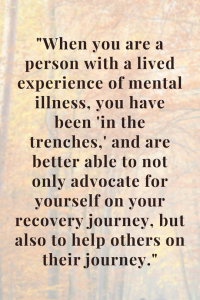 When you are a person with a lived experience of mental illness, you have been “in the trenches,” and are better able to not only advocate for yourself on your recovery journey, but also to help others on their journey. I live with both Major Depressive Disorder and Generalized Anxiety Disorder. Through my experiences with a variety of medications and therapies, hospitalizations and periods of crisis, I have learned that having a strong support network of practitioners, family, and friends is critical; yet, my own contributions toward my personal recovery are equally important. It is this experience with the mental health “system” that inspires me to learn more about it, to educate myself and others regarding what resources and services are available, what needs are being met and which remain unmet, etc., that eventually led me to my local advisory council on mental health. How did you find out about your LAC and what was the process like to be selected as a member? Originally, I was unaware that my LAC existed, until my therapist saw an LAC member recruitment ad in the local newspaper and thought I might be interested. Initially, I was more curious than anything, intrigued that elected officials would not only ask for, but place value on my personal experience in mental health. I completed an application and an informal interview with a county liaison, and the county commissioners appointed me to a three-year term. Eight years later, I continue to serve on the LAC, now completing my third and final three-year term (my county permits a maximum of nine years of service on an advisory board). During my tenure, it’s been an honor to serve with people who have like-minded interests and are extremely passionate about them. The members, both past and present, are vibrant, intelligent, compassionate individuals who are totally committed to improving the status of mental health in Carver County. These individuals, more than anything else during my time on the LAC, have inspired me to continue with my service and work hard toward creating a more equitable and inclusive mental health system in my county. So you’ve been a member of the Carver County LAC for eight years, and have served in official capacities as secretary, co-chair, and chair! Are there barriers that you’ve had to overcome in order to be an active member and leader? Fortunately, I have not found that being a person with a lived experience of mental illness is a barrier: like any other group, you prove yourself over time via your commitment and work ethic, and members have voted for me based on merit and not my status as someone with “lived experience.” Yet by its nature, Major Depressive Disorder can present its own barriers in that it’s often difficult to find motivation and energy to complete tasks when one’s symptoms are high. Also, being a perfectionist means that I sometimes work harder than necessary and put in extra hours. Finally, the time commitment itself can be challenging, and even a barrier in its own right: recently, I took a three-month leave of absence to attend to family issues, not having time for both them and my service on the LAC, and the Council and the Commissioners were incredibly supportive in this regard. What advice would you give to anyone interested in getting involved in their county’s LAC? If you are truly passionate about mental health issues, have the requisite background or experience with it, and are willing to invest of your time – go for it! It’s critical to realize that being on an LAC is not about what you can get out of it, although you do get plenty, but rather what you can give to it. If you keep that in perspective, you will give and gain a lot during your tenure on an advisory council. Keep an open mind to hear about and learn new thoughts and opinions (not everyone on the council will agree with you or comes from a similar experience! ), and practice patience. A fellow member on my LAC once told the story of the starfish: A person threw beached starfish, one at a time, back into the ocean. A passerby asked him why he did that when he couldn’t possibly save all the beached starfish. Grabbing another one to throw into the ocean, the person replied, “It matters to this one!” (For more information, refer to ecologist and author Loren Eiseley.) That’s how working on an advisory council is – you may not be able to help everyone in your community who is affected by mental health issues, but what you do matters to those whom you positively impact! In summary, during my time on the LAC I have learned about the legislative and societal pressures that impact mental health services, and I have learned more about myself and my capabilities, especially as I served in various offices. More importantly, I have learned not to let my illness define me – it is an invaluable part of who I am, but it is only that, “part” of me. Finally, I continue to learn that everyone has a story to tell in life, and that listening to those stories makes my life story richer and more complete. Go to your county’s website, and look for the page that lists ‘Citizen Advisory Boards’ or ‘Advisory Boards’. These are usually listed under the ‘Government’ tab on the webpage. Read another story about peers participating in LACs here! You ask, our advocates answer. This month our peer advocate, Suzanne, discusses person centered planning. Meet Julia, a peer advocacy client. She called us because she felt her case manager was not listening to her. Julia’s case manager had never asked her what her goals were for housing. Without asking, her case manager picked out an assisted living facility. Julia did not want to move there. Instead, she wanted her own apartment in a diverse community of people of all ages and abilities. Julia’s peer advocate wrote a letter to her case manager mentioning her right to person centered planning, community integration, and transition services. The advocate also identified Julia’s reasonable housing goals. The advocate served as a conduit for Julia to be “heard” by her case manager. After the case manager received the advocate’s letter, she called Julia and actively listened to her. Finally, Julia felt listened to and respected. Soon, Julia will be in her own apartment near her grandchildren—integrated into the community. A recent development in case management services is the requirement that services be provided using person centered care planning. 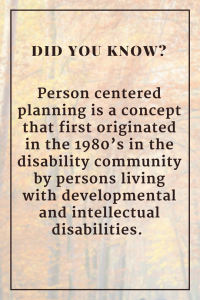 Person centered planning is strength based and focuses on individual capacities, preferences and goals. This means that rather than being told what to strive for and how this should be accomplished, the person receiving services works together with their provider to identify reasonable goals and to decide how these goals can be achieved. How do I go about identifying my goals? When thinking about your goals it is important to consider not only what you ideally want but to also think about what is realistic. List the goals you would like to see happen in your life. For example, these goals might include: a) part time employment, b) living in your own apartment, c) having more friends, or d) reconnecting with family. Can I get everything I ask for? Keep in mind, you may not get everything you ask for. Your request must be reasonable, and will at times depend on ability of the community to meet your needs/request (i.e. whether the type of housing you request is available in the community you wish to live in). If your case manager thinks a goal is not reasonable, ask them to explain why and what you can do to change the situation. What is impossible today may be a possibility in the future. How do I approach my case manager about person centered planning? Before you meet with your case manager, think about how you want to prepare for the meeting and create a list to follow so that you don’t forget anything. To begin the conversation let them know that you have heard about person centered planning and would like to review the goals currently identified in your plan of service and possibly change some of them. Let them know that you have given a lot of thought about your life goals and what quality of life means to you. If you have talked with mental health professionals, friends, or family to gain feedback and support, which is highly recommended, pass that information on as well. 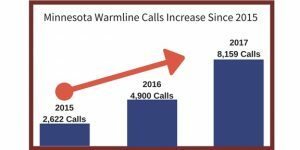 Calls to the Minnesota Warmline reached a record high in 2017, with more than 8,000 calls during the year. The total reflects a 67% increase in the number of calls over the previous year. Since 2015, the number of calls to the Warmline has increased by more than 200%. A number of other changes were made to the Minnesota Warmline in 2017 to improve the service, including adding a call “queue” to enable callers to wait to talk with a Certified Peer Specialist (rather than calling back later if the lines were busy) and providing a texting option for people to use in addition to the traditional phone line. The Minnesota Warmline also added a functionality within the phone system in 2017 that enables operators to provide a “warm hand-off” from the Warmline to county crisis lines. The Minnesota Warmline takes calls from across the state of Minnesota, and is largely supported by the Minnesota Department of Human Services. In 2017, people called the Warmline from 74 counties across Minnesota. The Minnesota Warmline provides a peer-to-peer approach to mental health recovery, support and wellness. Calls are answered by a team of professionally trained Certified Peer Specialists, who have first hand experience living with a mental health condition and receive ongoing training and support. The Minnesota Warmline is open Monday through Saturday, 5 PM to 10 PM, and can be reached by calling 651.288.0400 or 877.404.3190 or by texting “support” to 85511. This entry was posted on January 25, 2018 by Shannah Mulvihill. You ask, our advocates answer. In our Ask the Advocate column, we will address topics that we frequently receive calls or messages about. Our advocates often talk with people who have questions about the crisis services that are available in Minnesota. We receive calls from people who are looking for information about crisis services for themselves, as well as from friends and family members who want to support a loved one who may need to access crisis services. This month, Suzanne, our Peer Advocate, answers your questions about crisis services. Q: What are the different kinds of crisis services? A: There are four different kinds of crisis services: phone crisis, texting crisis, mobile crisis and residential crisis. Phone services are the entry point into the crisis system. A phone counselor may be able to provide you with what you need (calming and resources) or they may refer you to a mobile team, residential crisis facility, nearby urgent care or hospital. Texting crisis services assist with resolving distress and providing resources and referrals. Mobile crisis are face-to-face services. Residential crisis involves short-term overnight stays of a few days until the person is stabilized. Phone, texting and mobile crisis services are provided throughout the state, whereas residential crisis services are available in a limited number of counties. Q: How do I access crisis services? A: The main way to access crisis services is to call your county crisis number. Use our search tool to find your county crisis number. Q: Will mobile crisis services meet me in a public location? A: Yes, mobile crisis services can come to your home or meet you anywhere in the community. Q: Can I directly access residential crisis services? A: No, only a crisis team, an emergency room doctor or a mental health professional who has assessed you can refer you to residential crisis services. Q: Can a loved one who is concerned about me request crisis services? A: Yes, a family member or friend can call a county crisis line and request a need for crisis services. They should call the county in which the person experiencing the crisis is located at the time of the crisis. The crisis team counselor will ask questions to determine level of need. Q: What happens if I have no insurance? A: Having insurance is not a requirement to receive any crisis services. Q: Is it possible to prepare for a crisis? A: Yes, you can create a WRAP Plan (Wellness, Recovery, Action Plan), Steps to Wellness Crisis Plan or a Psychiatric Advance Directive. If you would like further information about these planning documents please call Mental Health Minnesota and schedule an appointment to talk with a peer advocate. This entry was posted on January 18, 2018 by Shannah Mulvihill. We’re excited to introduce a new feature, Peers in Action. Each month, we’ll interview someone who has used their own experience living with a mental illness to take action in their community and help others. Last week, we spoke with Jenna Erickson, an avid mental health advocate and speaker who works as a Certified Peer Support Specialist. Jenna, can you tell us a little bit about yourself and what led you to start publicly sharing your recovery story? I live with Borderline Personality Disorder. For years, my life was a constant emotional roller coaster filled with self-loathing and self-destructive coping mechanisms. I spent much of my young adulthood in and out of mental health facilities, treatment centers, and hospitals, eventually ending up in the criminal justice system. This was an awakening for me. With the help of some amazing and supportive family, friends, and providers, I was finally able to accept my illness and begin working on recovery. I began sharing my story publicly in 2014. My current therapist teaches a class on serious and persistent mental illness at the University of Minnesota School of Social Work, and she asked if I would be willing to share my story with her students. Everyone was so kind and welcoming, and I realized that by sharing my story, I could help others. Since then, I’ve had the opportunity to share my story with hundreds of students, police officers, professionals, and consumers throughout the metro. There’s a lot of loss that comes with mental illness, and speaking has allowed me to turn my painful past and subsequent recovery into a powerful learning experience for myself and others. Last year, you shared your story with patients at Anoka Metro Regional Treatment Center. Your story was particularly meaningful and hopeful because you were able to talk about your own experience as a patient at AMRTC. Can you talk a little bit about how you felt as a patient at AMRTC, and consequently, how you felt as a speaker there? I am so grateful that I had the opportunity to speak at AMRTC. As a patient, I remember feeling as though I was a prisoner, not only to the confines of the hospital but to my own mental illness. As someone who has been in both the state hospital and jail, the experiences were not as different as one would hope. Days dragged on with seemingly little regard for my sense of humanity or future health. I did have a few exceptional providers who not only listened to me, but spoke to me like I was a person, not a patient. I fondly remember one staff member who played card games with us, and occasionally brought us treats like puzzle books and sips of coffee from the “outside” world. She treated me like I was a human being at a time when I felt worthless and defeated. Returning to AMRTC for my speech last year was such a transformative experience. If you had told me when I was a patient that one day I would return to share my story of recovery, I would’ve laughed you out of the room! So, it was a bit like being in the Twilight Zone. The sights and smells of the building definitely brought back memories, and I did feel a sense of kinship with the people who attended the presentation. The strangest part was the realization that I could both arrive and leave without restriction! What was your message when speaking at AMRTC and what did you want people to know? This was definitely the most passionate speech I’ve given. I truly wanted the attendees to know that recovery is possible and to give them hope. I remember how hopeless I felt while at AMRTC, and I wanted them to know that this experience didn’t have to define them or hold them back. They, too, could recover and achieve their dreams. Hope is an essential aspect of the mental health recovery process. It is incredibly hopeful for people who are struggling with their mental health to hear personal stories from others who have been in their shoes, and who are now in recovery. What are your future plans and goals as a public speaker and otherwise? I plan to continue sharing my story with people around the metro and hopefully beyond. I am a recent addition to NAMI’s Speakers’ Bureau and I’ve had the opportunity to give academic presentations about mental illness too. Someday, I’d love to write a memoir. Thankfully I have years of journals to reference when I’m ready to tackle that! I am currently pursuing a bachelor’s degree in social work, and after that I’d like to obtain a master’s degree. Someday, I’d like to work as a mental health practitioner so I can help others who are living with mental health challenges. I don’t like to think too far ahead though, as we never know what twists and turns life has in store for us. Recovery is definitely a process, and I know there are both blessings and hardships still ahead. My biggest goal is to stay true to myself, enjoy the present, and let my life continue to unfold before me. What piece(s) of advice do you have for someone who is interested in publicly sharing their story of mental health recovery for the first time? Most importantly, remember you have a voice and your story is important. It takes courage to share the most vulnerable parts of yourself with others, and it is a deeply liberating and exhilarating experience. I can’t tell you the number of times I felt like I wasn’t getting through to an audience, and then someone would come up to me afterward and tell me how my story gave them hope for their sister, son or mother. Your story will touch more lives than you can count. You, yes YOU, can make an impact. Join Mental Health Minnesota’s Ambassador Network. Ambassadors have the opportunity to share their stories through writing for our blog and/or public speaking. Public speaking opportunities include speaking to students, educators, people living with a mental health condition, friends and family members of someone living with a mental health condition, policy makers, employers, employees, and the general public. Consider becoming a contributor to The Mighty. The Mighty is a community-oriented online magazine with a site specifically for personal mental health stories. This entry was posted on January 17, 2018 by Shannah Mulvihill. Mental Health Minnesota’s Beyond the Books workshop series explores topics that are essential to recovery oriented mental health care. The workshops are a continuing education opportunity for mental health care providers and are designed to offer a real world perspective that expands learning beyond the typical classroom experience. Each workshop focuses on a different aspect of mental health recovery from the perspective of people who have experienced living with a mental health condition. We recently held our second workshop, “Engaging Clients in Recovery.” The workshop was facilitated by Mental Health Minnesota’s executive director, Shannah Mulvihill, and featured a panel of Certified Peer Support Specialists who have experienced living with a mental illness. Each panelist shared their unique story of recovery, from when they first started to experience symptoms of a mental illness, to when they first received treatment for their illness, and to where they are in their recovery journey today. 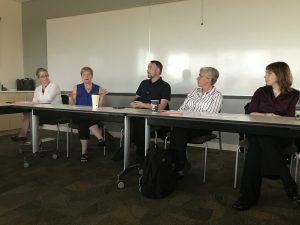 While each of the panelists experienced living with a different mental health diagnosis, and have had very different paths to recovery, similar themes emerged from their stories. All of the panelists emphasized the fact that having a mental health care provider who believed in them, and believed that they would recover from their illness, was an important piece of their recovery. Believe that your clients will recover, and that recovery is possible. Let them know that you believe that they will recover. Provide your clients with the information they need to understand their diagnosis, treatment options, and supports and services that are available to them. Having a safe place to live is an extremely important basic need. Without a safe place to live, it is very difficult for people to move forward with other aspects of their mental health recovery. Remember that at the end of the day, your client is responsible for their own recovery. They should be involved in creating their plan for mental health recovery. Ask them what their goals are for the future. It’s okay if your clients want to challenge themselves to go above and beyond their initial recovery goals. Provide support to help them succeed. Our next Beyond the Books workshop, “Effects of Social Isolation on Physical Health,” will be held on Thursday, October 26 from 8am – 9:30am at the Wilder Center in St. Paul. During this workshop, we will discuss the effects of social isolation and loneliness on physical health and talk about strategies that can be used to establish social supports. We will be offering the options to either attend the workshop in person or via live video. This entry was posted on August 30, 2017 by Shannah Mulvihill.